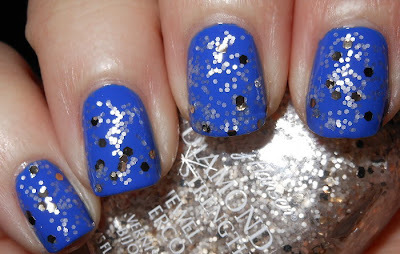 A few months ago I ran across the Sally Hansen Jewel Overcoats. I saw a few colors that did not do much for me, and and 2 empty slots for another color. I found out later the missing color was White Veil, and I wanted it. I scoured Walgreens for weeks, and I never saw it. I finally just gave up. I didn't need it badly, and since it was limited edition I figured I lost my chance. A few weeks later I was over at Ulta with Pretty Little Bottles, and she suggested I look for it there. I pretty much laughed her suggestion off thinking I'd never find it. I found it though! It out of place in their drugstore nail polish display. As much as I thought I had let go of my attachment to this polish, I was very excited to find it! White Veil is a mixture of small semi-transparent white glitters and larger gold hex glitters in a clear base. This is the weirdest/coolest glitter I own. I love these little white glitters they are so unusual! I think they pair nicely with the gold glitters. This glitter was also easy to work with. I didn't feel like I was fishing for glitters. Short and sweet. This is a awesome little glitter. I just wish these were not limited edition! Love the combo with blue! This is the only polish I purchased from this collection too. Soo pretty :) Anything with white glitter is OK with me! This looks awesome. It's funny. I've had White Veil for a few months now but haven't gotten around to using it. I just used it for the first time today haha :) I put it over Sally Hansen Smooth and Perfect in Sorbet :) it's so pretty and delicate. Oooh love this combo! White Veil is gorgeous! I loved the glitters from that Sally Hansen display, White Veil being my absolute fav. So glad that the Polish Gods smiled upon you and led you to it! I also looked for this one for quite a while. The places that had a display for this line of SH never had this shade in. It seemed to appear apparently around the first of this year. Like you, I am gaga over the white sparce glitters and that's saying something for me since I am going through a huge no glitter wear or buy thing - I have been positively saturated with the look up to my ears and no matter how unique an indie glitter seems, I don't want to buy them anymore. I tire of most glitters really fast and want them off before their time is done on my mani/pedis - unless they are super fine like more of a topper effect. This is so pretty! I love the different size glitters! It looks pretty on the blue. This looks super pretty over the blue! Thank you for the swatches! I was going back and forth on whether I need this. I think I do. It's so unique and great over that blue.